This is the fourth in our series of articles about SY Esper’s complete refit in Thailand for Sailing Today magazine. The refit of Esper in Satun, Thailand, was extensive but perhaps the most complex aspect was the rewiring, which included the installation of a new navigation system, new lighting and extra circuits. We also had problems with corrosion around the distribution panel due to water ingress via a badly mounted deck fitting. With the boat stripped and gutted of her interior, the refit was a good time to tend to all these issues and improvements. During the refit, Esper benefited from rewiring half her circuits. The other half (lighting and mains) was left as the condition of the wires was excellent: they hadn’t suffered any corrosion. The cables that were replaced were mainly external. This included the new instruments at the top of the mast, as well as existing instruments such as the VHF cable and cockpit. Internally, circuits were extended via junction boxes, while the distribution panel was ripped out and wired from scratch. The distribution panel was completely rewired with an easy-to-follow line of cables that are labelled and fitted correctly – it is finally a joy to look at! The leaking deck fitting was filled and the cupboards enclosed so that there is little chance of condensation build-up or extraneous leaks getting into the core of our panel. The whole area was divided into three ‘cupboards’ with the distribution panel and break panel on the right, while the middle cupboard houses the 12V to 12V regulators for the lights. 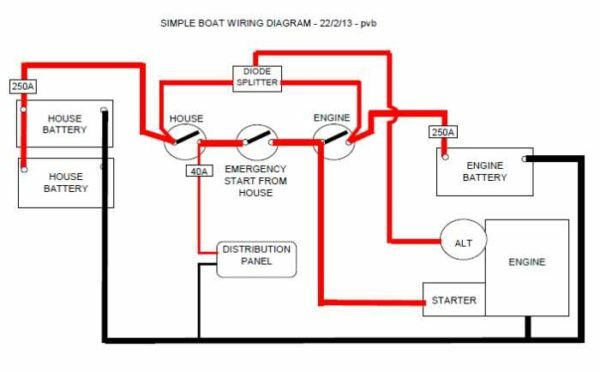 The charging circuit, specifically the cabling between shore power or alternator to the batteries was in good order. The biggest addition to the circuit was the inclusion of 250A breakers before the battery terminals. We kept our Exide 6V golf cart batteries wired in series-parallel. 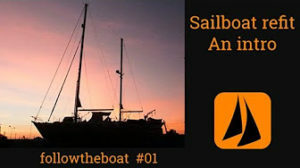 They cost us $500 (c£412) in India, are in their fifth year and take a hammering as full-time liveaboards. We are not yet convinced of the price-performance ratio of alternatives like lithium. No doubt this will change in time, but for the moment as we cruise locations in Asia where only traditional flooded batteries are available, we’ll stick with the KISS principle. Esper had been running LED lights since the first generation festoon LEDs were available, and we were the first boat we knew of to use an LED anchor light, but we wanted to go all LED. We purchased 5m strips through eBay, half of which were rated at IP68 (submersible in water). These were put around the areas closest to the outside (near hatches and in the galley). The strips were recessed behind the new headboards in channels that were painted black. We divided up our lights into four main circuits: forepeak; saloon; galley and heads; and rear cabin. Each circuit, if powered on fully, will not draw any more than 10amps, which was the limit of our voltage regulators – more on that below. The lights in the saloon were divided up into six separate groups: upper, middle and lower, one on port and one on starboard. They were all wired via a six-way standard domestic switch, and then via a dimmer which, for the really lazy, has remote control too. We found that the LED remote control would not only dim the lights but turn the volume down on our stereo! With the lights receiving anything from 11.5V to 14.4V, depending on the state of the batteries, we wanted to ensure they didn’t burn out. The LEDs we purchased were rated between 11V and 18V, but we didn’t want to take any chances, so we installed a voltage regulator on each circuit. These were purchased through eBay at around $45 (c£37) each and came as small heat-sink aluminum blocks. Another boat in the yard put in LED strips without voltage regulators and found they burnt out within 12 months. A sailor once told me a story of how a boat caught fire after a ceilingmounted fan was left running whilst the owners were ashore. The fan fell from the ceiling and smashed, but the motor kept running causing the fire. I swore to put our fans on separate circuits with the ability to isolate them all when we left the boat. Separating them from the lighting circuit reduces the draw on each circuit too. Since we charge many devices via the 5V USB port, we opted to install USB sockets around the boat. 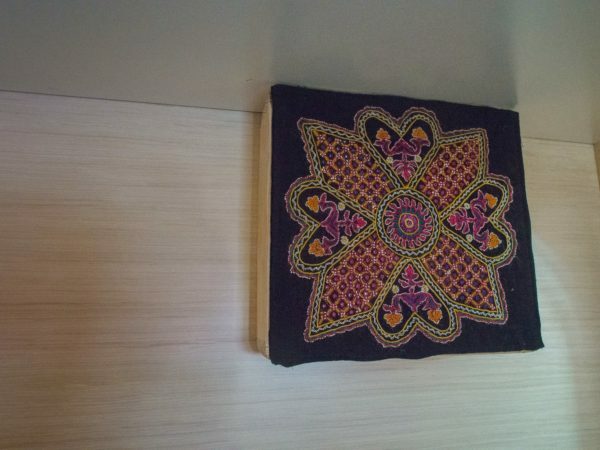 We sourced these from a caravanning website so they match our light switches and have a useful surround to prevent wear on the veneer. We installed one waterproof double USB port in the cockpit box along with a waterproof cigarette lighter socket. We love our music. A good quality system with a large, easy to access library was paramount to our evening’s entertainment. We’ve always used an Alpine car head unit to run quadrophonic speakers, plus a sub when we want to, but we wanted to extend this to our movie collection. We sourced an Aleutia R40 12V mini PC, pulling just 1.1A. This then allows us to run external hard drives to store our music and movies, each of which is run via a 12V regulator to ensure there are no voltage spikes. We run the Kodi media player app via smartphone or tablet either to control the movie on TV or streamed to the device. The TV was the largest 19V flatscreen available at the time in Thailand, and was cheap. It is protected with another 12V to 19V regulator. With six speakers in the cockpit and four down below, not forgetting the small sub-bass, we use our sound system to scare off anyone who anchors too close. For backup we run a Samsung notebook with a cheap 14in Acer monitor. We no longer use this for our primary navigation but have set it up to be there as backup should our primary navigation fail. It has a USB-powered GPS puck attached making it independent of the ship’s installed system. The mains circuit didn’t need rewiring but we added additional mulch-sockets, which usefully allow for different plug types. We have wired our 1kw inverter in-line into the mains circuit, meaning we can switch between 240V shore power, or 12V run through the inverter to power the AC sockets. We’ve installed additional smaller inverters to run laptops and 240V fans. On our travels down the Red Sea, our original hydraulic ram packed up, so we were relying on our Windpilot windvane. All very well until you run over a fishing cable and rip off the auxiliary rudder so you’re left to hand-steer 1,200 miles across the Indian Ocean running with the southwest monsoon. With this in mind, the biggest improvement in all the electronic updates was the installation of a new B&G navigation system. We inherited a B&G system when we bought the boat, but we think it was at least 20 years old and it suffered from the usual age-old problems, including a drying hydraulic ram and burnt out pixels on the display unit. One of our biggest gripes was not having a chartplotter at the binnacle, whilst plumbing in waypoints would take around two minutes per co-ordinate as the chart plotter took a while to draw each layer as you zoomed in and out. At the core of the new system is the rate-compass and Zeus 12in touchscreen, which acts as the master to run the charts and receive AIS. We have a Zeus 7in plotter in the cockpit, which is the slave. They share chart information between them, and both work on the NMEA 0183 and NMEA 2000 networks. Whilst the 12in touchscreen is an added luxury to have at the chart table, we wouldn’t do without the button-and-dial controlled 7in in the cockpit. Touchscreen is fine for tapping on menu items but they don’t ‘pinch to zoom’ in the same way tablets do, and any touchscreen is rendered near-useless when it gets wet. The system runs over Ethernet – useful for running a wi-fi network and a 4G radar. This last is solidstate, so up and running as soon as it’s turned on and drawing far fewer amps than our old, cheap Furuno 1623, which lasted all of two years. Also its ability to pick up small objects is phenomenal. On one 120nm solo nightsail, I was concerned to see what I thought were long-tail fishing boats on the radar. Cursing the local fishermen for not lighting their vessels, it wasn’t until I went past one that I realized the radar was actually picking up the flags on the fish traps. The Triton displays are a joy to look at. They claim to allow zero condensation build-up, have a 170 degree viewing angle and, apparently, 30 per cent less draw than rivals. But it is the quality of the brightly coloured displays that really make them stand out. SOLO SAILING IS GOOD FOR YOU! Our two Tritons are mounted on the cockpit box, a distance of around 3m that Liz used to struggle with. These are clear enough for her to read them without her glasses. I’m a strong believer in networked, dedicated chart plotter navigation. While we use Navionics on our smart devices, we’ve been in conditions where smart phones and tablets become almost unusable, even with a waterproof housing. The fact you have to power these devices by USB and leave them on their brightest screen setting in daylight only compounds the problems of relying solely on a touch-screen smart device for navigating. We added a few peripherals, including a mizzen flood light, sourced from China for around $10; a cockpit light mounted under the binnacle which lights up the cockpit table, as well as waterproof USB and cigarette power points in the cockpit box. DISTRIBUTION PANEL – FINALLY A JOY TO LOOK AT! With a year to plan our refit, we had the luxury of time on our side to consider and research all electronic options. We’re happy with our setup, as it answered all our current electronic requirements, built around our own specifications. Our solar panels are now approaching 10 years old and, at the time of installation, matched our electronic consumption. This has since increased and we’d like to install additional panels, run via an MPPT controller. With hindsight we should have stripped the fridges and rebuilt the insulation. Although our fridges are fairly efficient, I have no doubt the foam could do with replacing. After installing our LED strips, it occurred to us that we could have backed the strips onto aluminium conduits instead of gluing them directly on to the wood. This might have reduced the possibility of over-heating and potential fire hazards but the lights do not get too hot and an aluminium strip may only have exacerbated the chances of overheating. The jury’s out on that one. Thanks friends for this blog. Updating my electronics is also on my schedule as mine are original 1996 editions on SV Illusions and the info you provide is a help in making my decisions.